Summer research and camp life is in full swing! It has been an interesting week for squirrel research. We saw our first Grizzly bear just up the road from one of the grids. Lisa and Shannon kicked two flying squirrels out of a cavity when they were looking for a nest and Jess witnessed red squirrel infanticide which is cool but sad. A couple squirrels were found dead (predated on) on one of the grids. Nests are crazy – some squirrels managed to move pups as we were climbing their trees so we had to follow them across grid. A couple of squirrellers witnessed a grey jay steal a pup while another threatened the nest. We checked all the buckets on AG and took away all the peanut butter except for on the breeding female’s midden where we left 250g of peanut butter. On the way to do this, a lynx was spotted. Trapping has been moved yet again and is now right after supper with only one check and we have had more success than we have had for a while. One of the squirrels (White/Red) has become the camp squirrel, she is often seen running around with nest material, some stolen from camp itself. The whole camp was restyled to discourage more of such pilfering. Shannon and Hannes (part of the winter crew) left for Iceland on Sunday so camp felt a little empty but we also had some visitors. Stan came up for a week and climbed some trees that everyone thought were impossible. 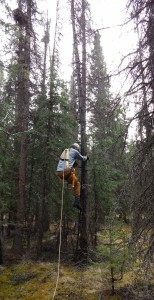 He even tied two trees together to get to a nest at the top of a snag. Jamie came to visit too and livened the camp up a lot. Squirrel Camp restarted Frisbee Tuesdays with Kluane Base camp and we have been going there every week since to toss a frisbee around. Frisbee Tuesday was fun this week, although only six people played. At the end we were convinced to played rugby. It was hard to grasp the concept that you can run with the ball right after playing frisbee where you can’t move. The hare crew arrived last week, and brought JD who has rapidly become the beloved camp dog. Over winter, Lisa caught a hare in a juvenile (small) trap. I’ve only seen pictures but it looked squished! Manu will be leaving camp to go travelling with her sister. Jordan and Jess went fishing a couple of times but have yet to catch more than a rock and lake weed. The team for this year’s bike race from Haines Junction to Haines Alaska was decided on Thursday. We hope to finish the race not dead last!